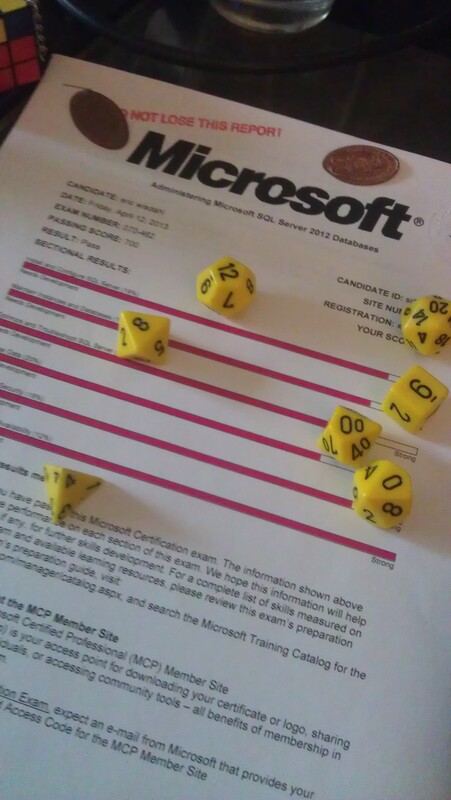 This morning I passed the 70-462: Administering Microsoft SQL Server 2012 Databases exam. I feel quite happy with this accomplishment for many reasons, least of which is being woken up at 2 AM by my son and not being able to go back to sleep until about 4:30 or 5 – and still being a functioning human being at 6:30 AM when I woke up to get ready and at 8:30 AM when I was at the test center and ready to get started. Such is the life when you have a newborn. But I wouldn’t trade it for anything. Speaking of which, preparing for this exam is something I’ve done off and on for the past month and a half or so with a gap of about 3 weeks in the middle. I would guess overall I spent about 40 hours on it. As a set up for practicing for the exam, particularly for practicing all of the high availability stuff which I do not feel particularly strong in, I downloaded and set up several virtual servers with Windows 2012 Core. I learned how to interact a bit better with the system through powershell, figured out the domain controller and active directory enough to create a domain and users, etc. I’m still NOT great at any of this, but I felt accomplished getting the environment setup enough to talk to each other. I was prepared. I was going to do all sorts of cool tests! … I pretty much ignored it. But it was about 10 hours of the 40 I spent. Once the lab environment was set up, I think I started out relatively strong by looking over the exam objects and trying to determine what areas I needed to look at most. I didn’t necessarily want to do the same thing I did with the querying test and study things which I was already relatively strong in as I felt a little bit like I wasted time with that test. Looking at the list, however, it seemed like there was enough on it that I needed a refresher on that I determined that I ought to try to do a complete review. 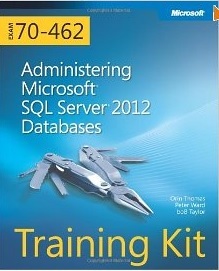 So, I read the entire book Microsoft Press Training Kit (Exam 70-462): Administering Microsoft SQL Server 2012 Databases book by Orin Thomas, Peter Ward and boB Taylor. I’m not entirely sure how I feel about the book. On the one hand, I believe that it is better than the Querying book (which I thought was really pretty bad). On the other, it still feels a bit like it traded in depth and breadth of knowledge for a type of tutorial follow along. This is probably really great for some people. I found myself reading along and promising myself that I would come back and do them after I finished reading the whole book (I didn’t). I do feel like this was a good refresher book, but I’m curious how much I would have learned from it if it were all I had. Several of the reviews for it on amazon say that you HAVE to follow the links provided in the text in order to do so. After finishing up with the book, I went ahead and took several of the practice tests that come with the book. I did four in all; one the first night after finishing, a second on the second night, and two the night before the exam. On each, I felt a little bit stronger on the questions I was seeing – but I was seeing a lot of the same questions again and again. I did make sure to review the answers, both for those I got right and those I got wrong. Some of the questions definitely had better explanations than others, but it was a good exercise overall. Note: I saw at least one question that the answer was wrong… so, if you are fairly certain that you are correct, double check online and try to recreate the answer. The people behind the practice tests are human too. Finally, I watched the born to learn video*. This video provided me with one awesome bit of knowledge that I really should have caught on to but hadn’t to this point. Every answer has to pass the Plausibility requirement. That means that every answer has to be, or at least have been at one point in time, a valid thing. Therefore, all of the times in the past for practice tests where I sat back trying to guess if there really was a dmv named XYZ I was not using all of the tools available to me since it HAS to actually exist if it is presented. Now the question is whether or not it still exists and whether or not it would be useful in the current scenario. Upon hearing this I double checked just to make certain. I can’t talk much about the exam itself because it is under NDA. With that said, I believe that I can comment that my version of the test had a number of questions within the given range (40-60) and that I felt a lot better about the way it was written and the content than I did about the Querying test. This had a few questions where you needed to know syntax or ordering or whatnot, but a large portion of the test dealt with theory and knowing which technology or setting to apply. In that regard, it was similar to the 70-432 Implementation and Maintenance test. Hopefully this helps a bit for anyone trying to go through the exam. If you are doing so, consider joining the Google Community for the 90 days to MCSA challenge. Good luck! * Quick tip, I downloaded it so that I could watch it at 2x speed as it seemed that the presenters worked through the material at an extremely slow pace. I find a lot of the technical videos that I watch could probably be consumed at a rate 1.5 to 2 times faster without loss of ability to follow along. Image | This entry was posted in Uncategorized and tagged 70-462, Book Review, certification. Bookmark the permalink. Congrats ! Really nice blog post ! Do the practice exams put you in the right direction? I setup the 6 win 2008 servers and tested the new features especially dabled with AlwaysOn and contained databases. After finishing the 462 book and overall preparation did you feel any chapters needed some reinforced learning?